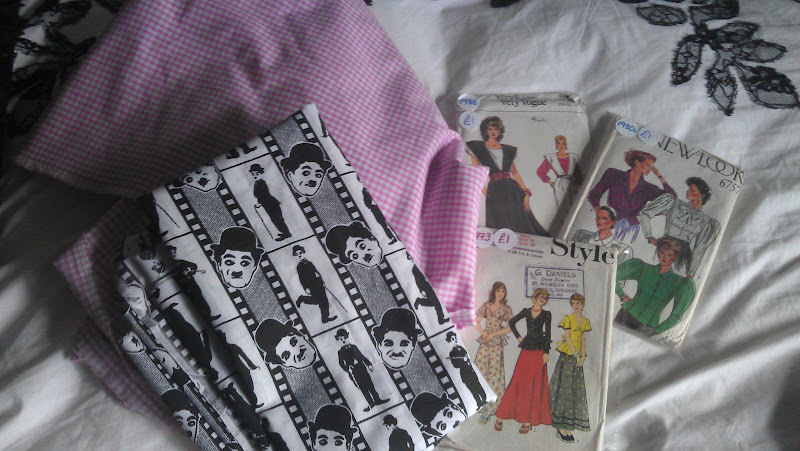 I bought these 1980s patterns about a month ago from a fab stall at the altrincham market, a £1 each! I thought they were rather 40s in style, alas I cannot afford the prices of real vintage patterns. Yesterday I finally got round to getting some material. I had in my mind gingham only, but then I spied this fabulous Chaplin print! What do you reckon I should make with it? I am thinking a peplum blouse of sort! That fabric is adorable!! A peplum blouse sounds good! I love the whole 80s-does-40s thing, because 80s stuff is so much cheaper than the real deal (sadly!) and it can look just as authentical! where did you find the chaplin print?? I am setting up my dining area as a mini-chaplin "museum," and would love to cover my bar chairs in chaplin fabric. i didn't imagine such a thing existed! Hello Janet, I have just sent you an email as I managed to find some on eBay do hope you get it in time! So will you show us the result ?